Architectural beauty can be considered a local public good – no one can be excluded from the utility derived from looking at an appealing building, nor does the architecture deteriorate as more people enjoy the view. These characteristics have straightforward implications for the social efficiency of private investment decisions. If there is a positive non-marketed architectural externality, investments into architectural quality will be suboptimal if left to free markets. As with most local public goods and spatial externalities, it is therefore easy to rationalise planning policies that correct for a market failure. In fact, various planning policies around the world aim to preserve or create public spaces of particular heritage value or architectural beauty. As with most interventions into economic markets, however, there is a downside. Similar to green belts, which are sometimes argued to be among the main drivers of the affordability crisis (Cheshire 2014), policies aiming to preserve or deliver well-designed buildings can limit the extent to which developers can respond to demand and, thus, add to the scarcity of space. Against this background, robust evidence on actual or potential benefits of such buildings is crucial for the economic justification, but such evidence is generally scarce. Since Oates (1969), economists have analysed the capitalisation of a plethora of locational characteristics of and policies on house prices, including the benefits of being near to preserved historic buildings (Koster et al. 2014). So far, however, no causal link has been established between the architectural quality of a building and the effects on other properties with a direct view. In a new paper, we adopt the common assumption that house prices reflect all the costs and benefits buyers associate with a location (Ahlfeldt and Holman 2016). To deal with the problem that other factors (e.g. the quality of schools) may differ across locations in a way that is correlated with architectural design, we employ a spatial boundary discontinuity design (Gibbons et al. 2013), i.e. we compare property prices right across conservation area boundaries, where apart from the distinct architectural value, locations are similar. A novel feature of our analysis is that we conduct quantitative interviews to obtain a measure of the spatial differences in design character across the conservation area boundaries. The questions are asked in such a way that they can be aggregated to create an index reflecting the distinctiveness of a conservation area. 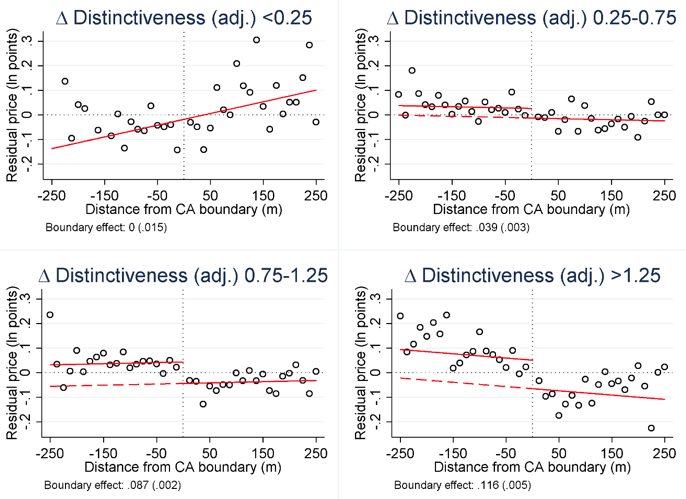 The nature of our identification is illustrated in Figure 1, where we show how adjusted (for observable characteristics) property prices change over distance from a conservation area boundary within (negative distance) and outside (positive distance) the area. Within the neighbourhoods of the least distinctive conservation areas, property prices do not change discontinuously at a conservation area boundary (top left). The trend in prices is smooth as one approaches the boundary from the inside and moves towards the outside. The more distinctive a conservation area is relative to the rest of a neighbourhood, the more a discontinuity at the boundary becomes apparent. Within the group of most distinctive conservation areas, property prices increase by as much as 12% as one crosses the boundary. In Figure 2, we compare the discontinuity in property prices at the boundary of each of our analysed conservation areas to our index of distinctive design. In line with Figure 1, the relationship is positive. The more distinctive a conservation area, the higher the price premium. 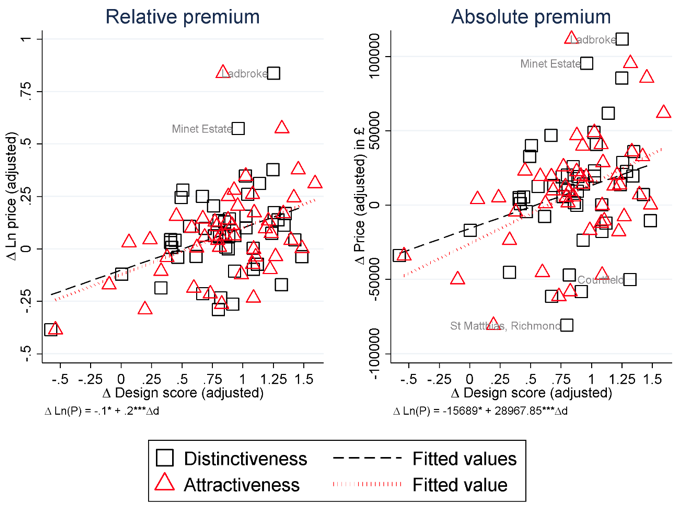 For a conservation area that is “neither distinctive nor non-distinctive” (Δ Design score = 0), we find a negative price effect of about 10% or £16,000 (in 2005 prices), implying that the costs buyers associate with the restrictions in conservation areas exceed the perceived benefits of the preserved design. For the vast majority of conservation areas, however, the net effect is positive. For a conservation area that, on average, is reported as being “distinctive”, we find a positive price effect of about 10% or £13,000. In further analyses, we show that these positive effects likely arise from spillovers (architectural externalities) as they are also incurred by the least distinctive buildings in our sample (built after 1945 and before designation). Moreover, we find positive design effects when comparing prices of properties outside conservation areas with and without a view onto buildings inside conservation areas. Our results provide some rationale for planning policies that seek to preserve and enhance the architectural quality of the built environment to internalise architectural externalities. Examples naturally include policies like those discussed here, but also could entail encouraging new build projects through master planning of larger sites where developers are actively encouraged to internalise externalities through design guides. In this context, we note that the applicability of our proposed method is not limited to certain policies or architectural styles. The key requirement is that discontinuous variation in design exist along clearly defined boundaries in a number of neighbourhoods. Such discontinuities can arise at natural barriers that interrupted urban growth, disasters such as fires, earthquakes or bombings that led to localised reconstruction, master planning, which can produce estates developed to particular design standards differentiating them from surrounding areas, or simply major buildings, which obstruct views on architecturally more or less desirable parts of a neighbourhood. We encourage the application of our method to other sources of discrete design variation and design-related policies to improve our understanding of the costs and benefits of the related spatial planning policies. Ahlfeldt, G M, and N Holman (2016), "Distinctively Different: A New Approach to Valuing Architectural Amenities", CEPR DP No. 11439 (forthcoming in Economic Journal). Cheshire, P C (2014), "Turning houses into gold: the failure of British planning", CentrePiece, Spring, 15-18. Gibbons, S, S Machin, and O Silva (2013), "Valuing school quality using boundary discontinuities", Journal of Urban Economics, 75 (0), 15-28. Koster, H R A, J N Van Ommeren, and P Rietveld (2014), "Upscale Neighbourhoods: Historic Amenities, Income and Spatial Sorting of Households", Journal of Economic Geography, forthcoming. Oates, W E (1969), "The Effects of Property Taxes and Local Public Spending on Property Values: An Empirical Study of Tax Capitalization and the Tiebout Hypothesis", Journal of Political Economy, 77 (6), 957-971.